The Hoover Dam and Grand Canyon Bus Tours are really interesting. When I was told that we would have to travel for hours in the bus to get to the spot, I was really disturbed, because I hate long road trips. I made sure I put a book in my bag to escape the boredom. But I was in for a pleasant surprise. Our Bus Driver who also happened to be our guide enlightened us about the history of the the Hoover Dam and the Grand Canyon in such an interesting and witty way that we did not have a single dull moment and I didn't even have to take my book out of the bag. Out of all the interesting things that our guide shared with us, the Joshua Tree caught my fancy, and before I forgot about it I wanted to document it and hence the post. 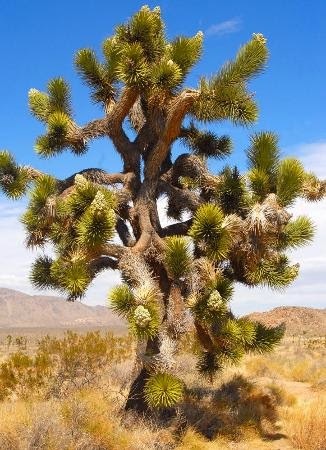 The Joshua Tree belongs to the family of and is a form of cactii found in the southern parts of America. Unlike other trees, you cannot measure the age of these trees by cutting the stem and counting their rings. That is because these trees do not have rings, they are made of Fiber. To measure its age, you have to count the number of branches and multiply it by 7. The Joshua Tree gets its name, because some sermons traveling here thought that this tree resembled the biblical character Joshua whose hands went up to the sky to pray to the Lord. Until we meet next time..keep reading. Such a beautiful tree! I found one interesting article about it. It has a lot of features you might not know. Follow the link.